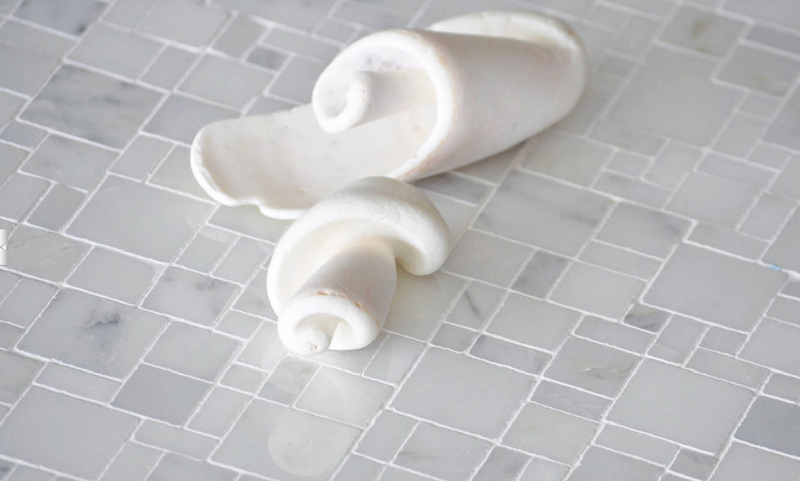 Mosaic Marble Bathroom Floor Tile - Mesh mounted polished marble mosaic in a mini Versailles pattern is suitable for both floor or wall applications. This marble tile mosaic is sold by the sheet. Each sheet measures close to 12" x 12". 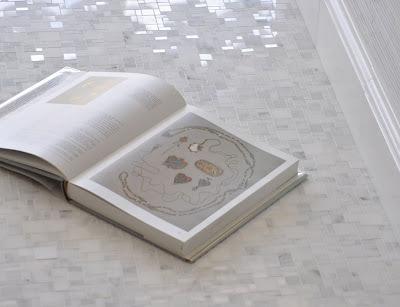 This is by far the most exquisite mosaic marble tile we have ever offered. One thing to look for is for smaller cut pattners; the smaller the pattern, the more beautiful the reflections are. It is more labor intensive to produce these miniature sized patterns but the result is well worth it. We personally hand selected this from a huge variety of tiles, this one really stood out! This truly timeless marble mosaic was cut in an ever stylish mini Versailles pattern. The mini sized luxurious mosaic tile works well in both modern- and traditional interiors. Made from small pieces of hand cut and hand placed quality statuary Carrara marble, the same marble Michelangelo used to carve his sculptures. 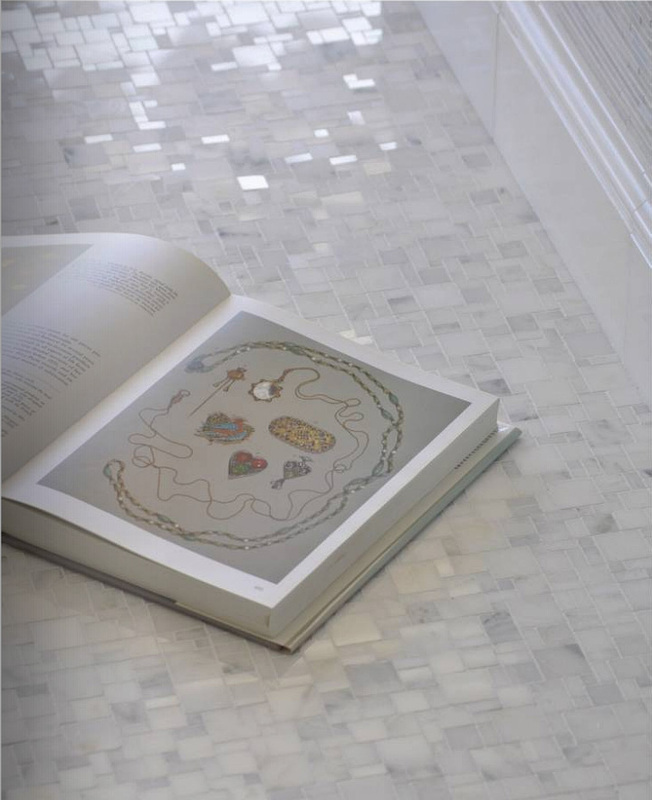 This quality marble mosaic tile emits a sense of grace and style that is difficult to replicate with any other tile. Simply beautiful. 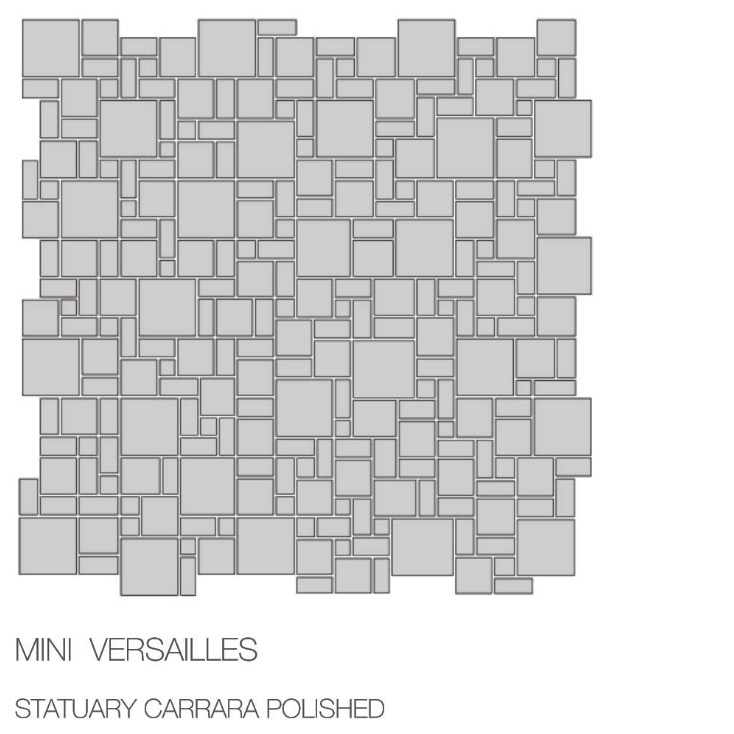 For this Mini Versailles Statuary Carrara Polished Marble Mosaic Tile, color and shading differ from one cut marble piece to another, and from one tile to another, as created by nature. Some marble colors are more variegated than others, so we recommend purchasing 2 full size tiles to appreciate the range and pattern of the color variegation. Smallest marble cut out (square) measures approximately 3/8" x 3/8". Largest marble cut out (square) measures approximately 1 1/16" x 1 1/16". Our mosaic tile collection is recommended for interior applications only and should be stored at temperature higher than 0°C/32°F. Professional installation required. Please check local building codes. For this product, all sales are final so make sure you purchase sample(s) first. Our mosaic tile collection is crafted by hand so variations in color, pattern and shade are natural and should be expected. 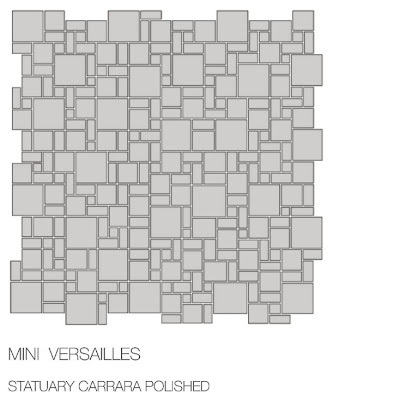 Pallet discounts are available upon request (100 mosaic tiles minimum order). Perfect for: flooring, mosaic, tiles, building materials, marble, floor tiles, mosaic tile, bathroom tiles, backsplash tiles, tiling, mosaics, wall tiles, entrance tiles, kitchen tile, mosaic tiles.